Sunderland vs Charlton: Sunderland begin life in League One against one of the bookies’ favourites for promotion as they host Charlton at the Stadium of Light. After a traumatic double relegation, Sunderland begin their time in the third tier at home. Jack Ross is the new man in charge following Chris Coleman’s departure. Ross is their 12th manager in ten years, but, with Ellis Short finally selling the club, this feels like a new dawn. With a raff of players leaving Wearside, it has been a busy summer up North. Big names have left the club, such as Jack Rodwell, Wabi Khazri and Paddy McNair. Those big wages have been replaced with players who know the division and most importantly, how to get out of it. Peterborough captain Jack Baldwin, Wycombe midfielder Luke O’Nien have injected some much-needing energy into the team. Former Sheffield Wednesday captain Glenn Loovens, Reece James and Tom Flanagan all bring vital experience in getting promoted from this division. Charlton are much fancied to return to the Championship this season, under the guidance of Lee Bowyer. Darren Pratley and Lyle Taylor have both joined the Addicks, but striker Josh Magennis has left, joining Bolton. The main aim for Bowyer is to continue last season’s form, which saw them reach the play-offs. Whilst Roland Dutchatelet remains the unpopular owner of the club, there seems to be more stability at the Valley after a traumatic few years. Therefore, I would expect to see Charlton challenging at the right end of the table and maybe even pushing for automatic promotion. They couldn’t, on paper, have had a tougher opening-day assignment, though. John Brooks is the referee for this match. The Englishman officiated 24 games in League One last season, accumulating an average booking points total of 27.3. This is one of league’s lowest and as a result, I’d advise a maximum of 30+ total booking points for this game. Come the end of the season, I expect both these sides to be pushing for promotion. Sunderland are my tip for the title, whilst Charlton should challenge for second place. This is an early test of what Ross’ side are made of and whether they can stand the test of the third tier. I think they’ll edge this match, but it could easily end level. 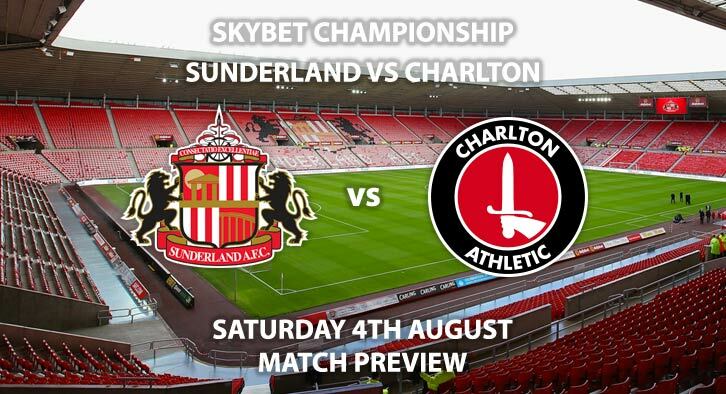 Sunderland vs Charlton Athletic will be televised live in the UK on Sky Sports Football with kick off at 12:30 GMT. Correct score: Sunderland to win 2-1 – (link no longer available). Sunderland to win 1-0, 2-0 or 2-1 – 7/4. BTTS and draw – 7/2. Maguire to score first – 11/2. Odds and markets last updated on Friday 3rd August 2018 @12:22 GMT. Markets maybe updated prior to kick off so keep checking back – we will update the time for when the tips were last updated when doing so.